This quality Armchair was originally constructed at the Parker Knoll factory that operated from Chipping Norton, Oxfordshire. 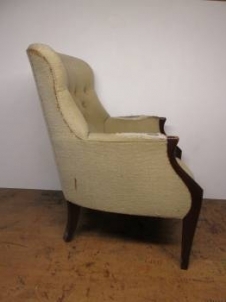 This particular chair has its original horse hair upholstery, which will be totally stripped off, and the chair will be completely rebuilt to its original factory showroom condition and the show wood frame will be treated to new French polishing. Dimensions - height 87 cms, width 67 cms, depth 77 cms.